Volunteers with Casey Trees installing new trees and shrubs around the biodegradable coir logs installed earlier to decrease erosion and increase groundwater supply. Spring 2014. The Signature Project in Dumbarton Oaks Park is a partnership between Dumbarton Oaks Park Conservancy, Rock Creek Park, the National Park Foundation and the National Trust for Historic Preservation. A full restoration of the ecosystem and built environment is leading to a long lasting, sustainable, Beech Grove and Bridge Hollow in the Park. The project site extends from the Lovers’ Lane entrance gate to near the Stone Bridge, and encompasses both sides of the stream. This project area continues to serve as a ‘learning lab’ for the complete restoration of the Park. We have been installing and then testing low-cost, low-tech solutions which resolve problems associated with stormwater, invasive plants and other environmental impacts in this small area. 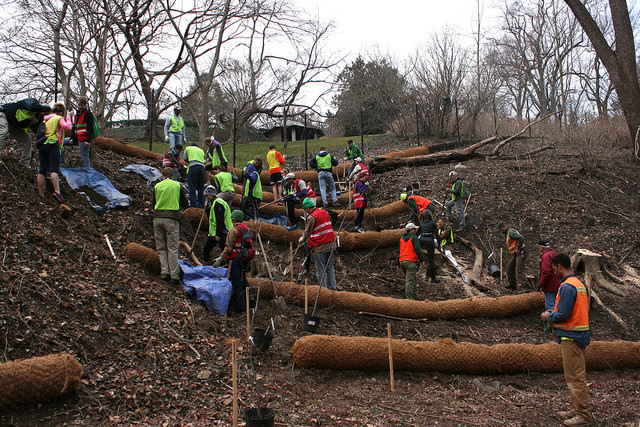 The work projects are accomplished primarily by volunteers working under the direction of Dumbarton Oaks Park Conservancy and Rock Creek Park. Work included the complete removal of invasive plant species such as English ivy and bush honeysuckle; the planting of native ground covers, flowers, shrubs, and tree species; the lining of steep slopes with biodegradable, coconut fiber, triage logs in order to decrease soil erosion caused by stormwater runoff; and the construction of a small, regenerative stormwater conveyance system. The Old Stone Pump House was re-mortared with the able work of EGI and Standard Restoration in the Fall of 2013. Walter Gregory and Buzz Seltzer restored and rehung the door and NPS installed a new lock. The Georgetown Garden Club purchased new tools to aid the work the Conservancy volunteers perform in the Park. Currently, May 2015, Waters Craftsmen I are repairing and returning the East Falls Dam area to the Farrand era design. The old broken platform was built in the late 1960’s. There is no documentation that identifies why this change was made. The NPS made the decision to return the area to the Farrand design. DOPC will be planting the area in the fall of 2015 with a call to volunteers to help. The area is currently being maintained by Dumbarton Oaks Park Conservancy.